Flamenco is a fundamental part of the Spanish culture and it is the country’s signature dance and music. Andalusia is the cradle of Flamenco and this art form has recently been recognized as Masterpieces of the Oral and Intangible Heritage of Humanity by UNESCO. It comes as no surprise that Seville, the Andalusian capital, offers a great deal in Flamenco entertainment. You will find many Flamenco shows, bars, dance classes, and stores throughout the whole city. So, be ready to have fun with Flamenco in Sevilla. A Tablao is a certain type of Flamenco establishment which often has its own company of performers. These places are often rather small and intimate. But there are also big scale shows in bigger venues that are much more theater-like. All places that offer Flamenco shows serve drinks and some also offer meals. Peñas Flamencas are cultural associations. A platform to meet, network and exchange ideas, but also give young talents the opportunity to perform and practice. Since there is no business intention, the shows go on in an informal setting with no service which makes it even more authentic. Watching a show in a Flamenco bar is different than watching a show at a Tablao. The shows at a bar are often more improvised and interactive. The audience is often encouraged to sing and dance. If you are interested to buy any typical Flamenco clothing, instruments, or music stop by many of the Flamenco shops. The stores that sell clothing often have their own designers for the dresses. In case you have the Flamenco fever and want to take dance classes, there are many possibilities as well. But there are of course other classes to learn the other Flamenco essentials, such as singing, guitar playing, palmas (the particular clap) and playing the cajón (a box-shaped percussion instrument). I don’t want to spoil the fun of looking for your own favorite Flamenco bar or store. The people of Andalusia are very open and sociable. 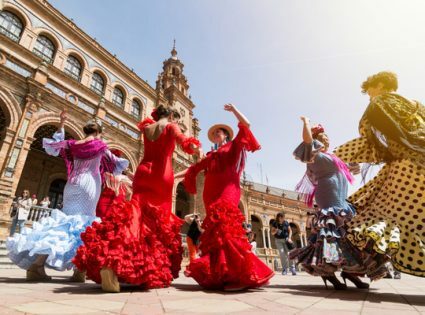 Staying in Seville, you will find a couple of places yourself to get to know the Flamenco culture and experience Flamenco in Sevilla.